A 26 year old native of Brooklyn, New York, TERRELL TAYLOR dropped out of high school in the 11th grade. “The streets were way more fun than school,” says Terrell. He spent 12 years actively involved in gang activities, fighting, getting arrested, doing nothing, returning to lock-up, and then moving from one dead end job to the next. “I was a dysfunctional, angry kid,” he admits. After a while, Terrell got tired of the street lifestyle. Finding it “too hard to make it in New York,” he moved to Worcester, MA - a place that had some familiarity because his Mom was there. Terrell says the slower paced environment in Worcester helped him to learn patience. 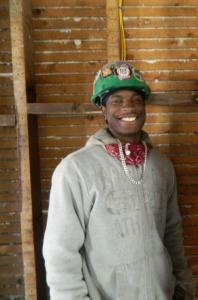 Terrell learned carpentry skills at the Stone Soup Community Center construction worksite project located at 4 King Street in a distressed neighborhood in the Main South section of Worcester, MA. The Stone Soup Community Center is a 501c3 volunteer-run umbrella organization that brings together various Worcester leadership development and organizing groups under one roof. In March 2009, a fire destroyed much of the building. Worcester YouthBuild, in partnership with New England Carpenters Union - Local 107, Job Corps and other organizations has joined forces to help rebuild the center which will also contain a low-income housing unit when it is fully completed. The building is being renovated in accordance with its historical appearance. Incorporating many “green” features, the project is aiming for LEED certification. While in the 2011-12 program cycle, Terrell and his fellow classmates also had the opportunity to participate in a Saint-Gobain Career Day in December 2011, visiting the SGC Abrasives and Ceramics Divisions in Worcester and SGC R& D Center in nearby Northborough.